It is a pleasure to let you know I am one of 20 hand picked nature photographers contributing to Cheetah Conservation Fund’s (CCF) “Cheetahs Alive Photo Exhibition” in London. The exhibition, in association with Strutt & Parker, will be on display at Patrick Mavros Art Gallery in London from 21st September to 7th October 2015, to raise awareness of the Cheetah’s plight in the wild. The exhibition is sure to inspire anyone who has an appreciation for fine art photography or a love of big cats. This year the exhibition will celebrate 25 years of groundbreaking research into saving Africa’s most iconic big cat. The images represent the work of many of the world’s finest wildlife photographers, including Andy Rouse, David Lloyd, Charlie Hamilton James, Federico Veronesi, Paul Souders, Suzi Eszterhas, Britta Jaschinski and Adrian Stiern. All of the images will be available to purchase, including signed prints by CCF patrons Jonathan and Angie Scott. Funds raised will support CCF’s pioneering work to protect the cheetah for future generations. My contribution to this is the image below; “Mother’s Love”. This Maasai Mara Cheetah, known to the guides in the Mara as Amani, was born in November/December 2009. She has brought up three cubs from a previous litter. This photograph is taken in February 2014. At that time she had one cub. 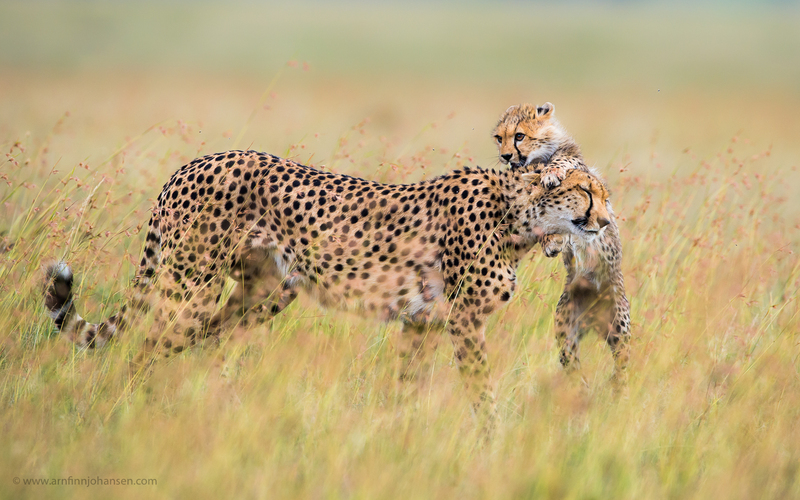 This was a very playful cub, and if one have the privilege to watch cheetah families over time one will understand that sure it is mother´s love in the animal kingdom as well. Nikon D4, Nikkor 600/4 VR, 1/800 sec at f/7.1. ISO 1000.